What are the tax rates for 2018 - 2019? What is the the national insurance rate? Do I pay more tax on second job? 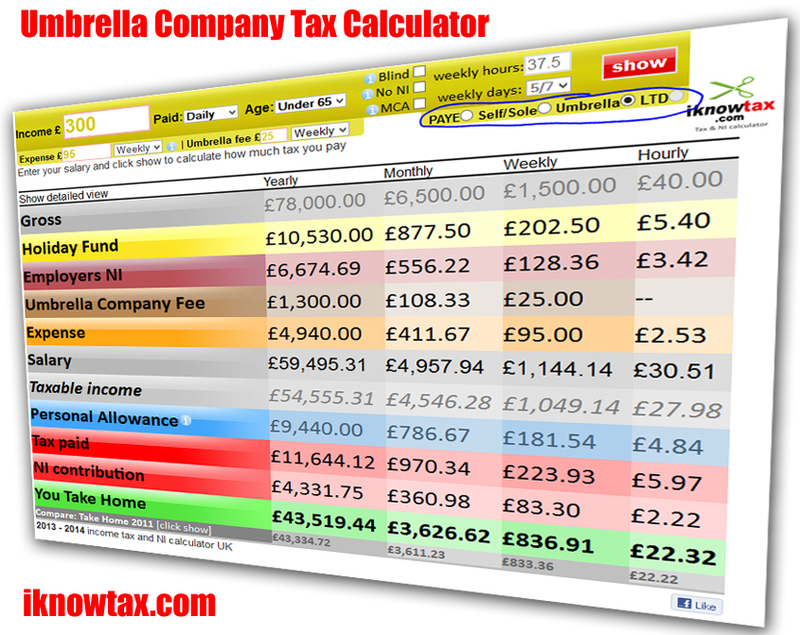 Is there an umbrella company tax calculator? Can I claim back over paid tax? When does the tax year start? P60 is a end of tax year summary of how much you have earned, paid tax and NIC. If you have got your P60 use last years tax calculator to see if you over paid tax. Is tax calculated after deducting national insurance or vice versa? No. You may have been thinking this; if one was calculated first, then the other, you could have saved some money. See the examples. Umbrella company take home pay calculator calculates a contractors take home pay after all the deductions. If you are a contractor and being paid through an umbrella company, you are taxed like an employed person and treated as employed. You will receive payslips. iknowtax.com offers the best umbrella company tax calculator. Do I get taxed more on the second job? You get taxed whatever you will have got taxed if you were earning this amount from the 2nd job on your first job as an additional amount of pay. So there is no special rates for a second job, no extra tax or less tax. All your earning is added together and then tax is worked out! For NI, you will pay if your second job pay is more than the minimum threshold for the NI per week. This is a free 2018 - 2019 UK online tax calculator website. It provides a free to use individually or commercially tax calculator tool. It also aims to make a complete beginner understand how tax is worked out. Feel free to read and refer to the tax calculator. Please comment below or email me your feedback or questions. One of the great features of this tax calculator is that it allows you to enter your hourly pay rate and the number of hours you work weekly. You can enter your standard weekly hours you work, to accurately display your pay hourly, and tax paid hourly. Ideal for freelancers, contractors (or anyone only knows their hourly rate) to work out tax paid. It also calculates as you type which will help a professional like an accountant (payroll, bookkeeping) that may have to constantly calculate. Another great feature is, it has a detailed umbrella company tax and NI calculator for anyone who is being paid through an umbrella company. You can see how much of your money is deducted for employers NI and for holiday (which you will receive when you go on annual leave or get any remaining holiday pay when you leave your post). So this is a great way to see what a take home pay will be for a contractor getting paid through un umbrella company. You can also compare on the tax calculator current years take home pay with the last years, so you can see if the new tax rates are better for you or not. Welcome to iknowtax.com where you will find Tax and NI calculators containing the latest official rates from the HMRC. It allows you to calculate your net income after tax and see what the taxman is taking. You will find lan easy to understand table showing the tax rates for 2018 - 2019 and the previous years. If you like this website please share the link and tell your friends, family and colleagues. This will keep this website alive and help improve ranking on search engines. What would you like to see on this website, let me know by emailing me at admin@iknowtax.com. You have come to the right place! This is the first stop for you to understand about tax rates and how it is calculated. You can learn from scratch here. After reading this page you can then search and ask specific questions on Google about tax. You will know what you're doing! Your tax is calculated after deducting your Personal Allowance. Everyone has Personal Allowance unless you are earning over £100,000 (which your personal allowance starts to deduct bit by bit until it reaches zero). Your tax is calculated on your salary (or earning) left after taking away your Personal Allowance amount from your salary (Personal Allowance is the amount of your salary where tax is not applied, making anything in that amount a tax free income) (Don't get confused; personal allowance doesn't mean that you get this amount as extra money coming to you, it is the part of your income (salary/earning) where the tax does not apply; is called Personal Allowance). Example, your salary is £35,000 per annum, your Personal Allowance is £11,850 per year; so £35,000 - £11,850 = £23,150. So on £23,150 is the amount where the tax will be taken from as a percentage (detailed examples below). Still, more is deducted for your National Insurance Contribution (NIC) if you have not reached the state pension age. The amount for National Insurance is deducted as a percentage on salary above £162 per week (£701.94 per month / £8424 per year). Look at the tables below. 樂Also it is not true that student do not get taxed. Students do get taxed like everyone else once their earning has gone above the tax free personal allowanace and tax free NI thresholds. As students usually work part-time hours they earn less which is usually below the personal allowance amount which is tax free thinking they dont get taxed. When they earn more during holidays by working more hours their pay goes above the tax free threshold and get taxed. What is Personal Allowance? Personal Allowance is the portion of your earning where tax is not applied, making that portion of your earning tax free. 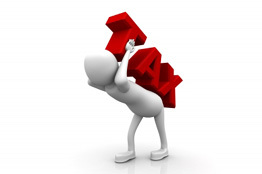 Taxable income is your earning where tax can be applied to. These are some that counts as taxable income: income from employment, self employment/partnership, pension, investment earning, rental property, state benefits. For more information visit: https://www.citizensadvice.org.uk/debt-and-money/tax/what-is-taxable-income/taxable-and-non-taxable-income/. Example: Salary minus Personal Allowance: £35,000 - £11,850 = £23,150. So on £23,150, 20% tax rate will apply as you can see on the table above this amount falls between £0 - £34,500. Example 2: Salary minus Personal Allowance: £50,000 - £11,850 = £38,150. On this amount (£38,150), 20% will be applied to up to £34,500 and on the remaining amount it will be 40%. Like this: 20% of £34,500 (out of £38,150), and 40% of £3650 (remaining of £38,150 minus £34,500). So the tax paid will be £8360. See the illustration below. See example #4 | Does Tax or NI come out first? National Insurance Contribution is payable by everyone, until you have reached the state retirement age. National Insurance pays for your state pension and other state benefits. You have personal allowance of £11850. Because your salary is below the Personal Allowance amount, you will not pay tax. Salary minus Personal Allowance; £5000 - £11850 = below £0, so there is no amount left to tax on. You will also not pay any National Insurance contribution because you are earning below £8424. So you keep exactly £5000. So £3150 is the amount where tax will be taken from. The tax rate will be for you is 20%. So 20% of £3150 is £630 (£3150 × 0.2 = £650). So the tax due is £630. Now to see how much money is left for you to take home, you need to also calculate the amount of National Insurance contribution that will be taken from you. Your salary is more than £8424 and less than £46,384 so the National Insurance rate will be 12%. Any amount below £8424 you don't pay National Insurance. So to apply the 12% rate you will need to deduct £8424 from your earning. That will be £15,000 - £8424 = £6576. £6576 is the mount where the 12% will be applied to deduct the amount for NI. So 12% of £6576 is £789.12 (£6576 × 0.12 = £789.12). Is NI deducted after taking out tax? NI is not deducted after your tax, or vice versa. -NI is not calculated and deducted on your earning remaining after the tax deductions. The NI calculations are applied to your full amount of your salary. Your personal allowance is £11,850. Subtract your Personal Allowance amount from £25,000. Now on £13,150 is where the tax will be deducted from. 20% tax rate will apply. 20% of £13,150 is £2,630. £2,630 is deducted for tax. For National Insurance (NI); Subtract £8424 from £25,000. That equals to £16,576. On this amount 12% will be deducted for NI. 12% of £16576 is £1989.12. For NI £1989.12 is deducted. Total deduction is £2630 + £1989.12 = £4,619.12. Your personal allowance is £10000. To calculate how much tax is due from you, you need to take away your Personal Allowance amount from your salary: (Salary minus Personal Allowance); £60,000 - £11,000 = £49,000. £49,000 is the amount where tax will be applied to. Now 20% tax rate is applied to £32,000 out of £49,000. See the Tax Rates table above. So 20% of £32,000 is £6400 (£32,000 × 0.2 = £6400). Now 40% tax rate is applied to the amount over £32,000 (of £49,000), that is £17,000 (£49,000 - £32,000 = £17,000). So 40% of £17,000 is £6800 (£17000 × 0.4 = £6800). Total tax due is £13,200 (£6400 + £6800). For National Insurance contribution, 12% rate is applied to salary between £8060 and £43,004 and the 2% rate is applied to amount of the salary above £43,004. Earning below £8060 you don't pay National Insurance contribution. So the the 12% rate will apply to amount between £8060 and £43,004 of your earning. And 2% above £43,004. Amount between £8060 and £43,004 is £34,944 (£43,004 - £8060). On £34,944 12% is deducted. 12% of £34,944 is £4193.28 (£34,944 × 0.12). The 2% rate applies to your earning from £43,004 to £60,000. Which is £16,996 (£60,000 - £43,004). 2% of £16,996 = £339.92 (£16,996 × 0.02). For National insurance contribution; £4533.20 (£4193.28 + £339.92) is deducted from your earning. Was this easy to understand and useful? Did you find anything confusing? Got any questions about iknowtax.com? Please let me know by emailing admin@iknowtax.com, commenting below or on iknowtax.com facebook page. Or am I just more confused than I thought! If i am Earning 33 grand a year i am getting taxed 40% if i am earning 32 grand a year i am getting taxed 20% how does that make sense? So, 0% on the first £9440, 20% on the next £32010 and 40% on the last £8550. It doesn\'t make sense, but that\'s because you\'ve made a mistake that many make, thinking that they\'re worse off by earning more. The £33000 numbers that you use aren\'t really right, but lets use someone earning £41000 and someone earning £45000. The person earning £45000 doesn\'t pay 40% on the whole £45000 (that would make them worse off than the person earning £41000). The only pay 40% on the amount above the 40% threshold, so on the last £3550. So, you don\'t get worse off the more you earn, but the extra bit gets taxed more, rather than the whole. Could you also explain how my tax would be affected if I was to get a company car? Although NI is easy enough to calculate if you earn a constant amount, it is possible to end the year to find you have paid too much and unlike tax, there is seemingly nothing that can be done about it. E.g. I have a part-time job earning me just below the NI threshold, so in theory, I should not be paying any. However, because my work is up and down, in some months I appear to be earning the equivalent of £22,000 p.a. and in others nothing. I am therefore charged NI on a month-by-month basis even though on an annual basis I should not pay any. OK, this is not a Kings Ransom at about £157 for last year, but the fact that I am overpaid by 11 years to qualify for the full state pension does not help the situation as there is no reward that I can see for overpayment. As I am a PAYE wage-slave, the only avoidance strategy I can see is to ask the person who inputs my hours to delay the last week of a good month, placing it in a low-paid month. Great page! Helped me a lot, because the UK tax and insurance system was quite difficult to understand for me because I am new to the UK. But now I really understand it and the calculator is just great. Good work! Keep it up! Good website - just what I was looking for. Can we have an example of how to work out for £100,000k+ - where personal allowance starts to decrease, also NI rate changes. Also how to work out K codes for company cars? I have pensions totalling about £26000 (gross untaxed) and taxed income from bank accounts of about £5000. How do I work out my tax code? If I am doing my first job ever in the UK, do I pay less taxes in the first 6 months? Privacy: This tool/website does not collect any salary information you enter to calculate your tax. Disclaimer: I am not a tax professional, so please do not use this information to make any big decisions. Do consult a professional when making any big decisions. Learn and teach yourself how the PAYE Tax and National Insurance (NI) is applied to your salary. UK Tax year 06 April 2018 to 05 April 2019.